KRAUTROCK has rarely been my cup of ale; the only German rock band I’ve ever loved is Neu!, and it took years of listening to Stereolab to adjust my metabolism to the repetitive, minimal, technophile grooves. 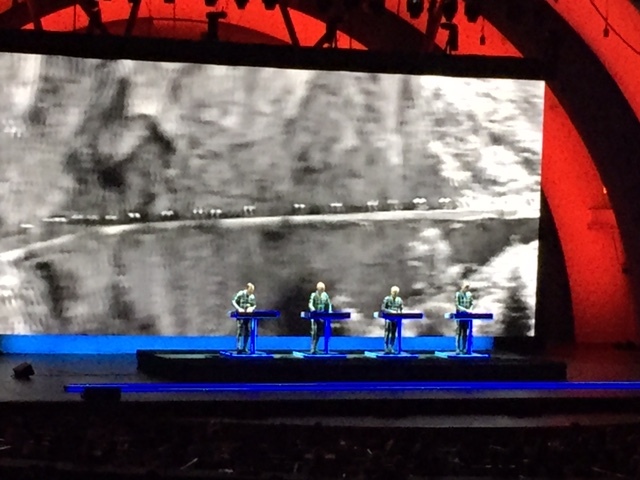 But I’ve heard so many good things about the shows Kraftwerk — who all but invented the genre, and scored its first big U.S. hit with “Autobahn” — performed at Disney Hall a few years ago, that their Bowl show was hard to pass up. It’s strange to see a concert where almost none of the instruments are played live: Most of what we saw last night was prerecorded “robot music,” and the band emphasizes a kind of ice-cold mechanical delivery that fits cleanly with a stereotype of hyper-rational postwar Germans. But the show, dominated as it was by 3-D projections of abstract patterns, silent film heroines, decades-old French bicycle races, and interstellar flights, was a thing of wonder. At times the show became an art exhibit, or one of those shows where a band plays behind a movie, like Philip Glass’s “Beauty and the Beast” or the Bill Frisell performances behind Buster Keaton movies. Musically, there were also obvious resemblances to the classical minimalism of Reich and Glass. There were of course various floating themes abut the role of the machine in modern Western life, and the meaning of being human in an age where humanism seems to be on the wane. To what degree does art need a human spark? Can I make the slightly less profound comment that the Bowl may be the most delightful place to see music of any kind? I wish more of the season was left. Here is another review, by my friend Steven Mirkin, on the BuzzBandsLA site.